Castle Danger Brewery is joining forces with the food trucks who frequent our taproom during the temperate time of year. The 2019 Food Truck Series is a relaxed and unique beer dinner experience featuring outstanding street fares paired with our dangerously good ales. 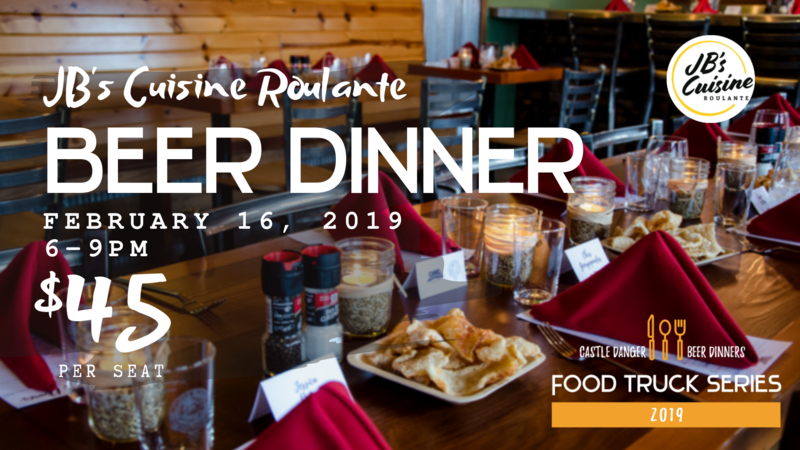 We’re kicking it off with JB’s Cuisine Roulante, who was a recent addition to our food truck selection in the fall of 2018. JB’s serves a delicious, fresh combination of French, Caribbean, and Mediterranean cuisine. We will be dining at the brewery on February 16th starting at 6 pm. Guests will receive a Castle Danger pint glass as a thank you and the night will conclude with a private brewery tour. Pork slowly cooked with Caribbean and Mediterranean spices served with fresh onion, tomato, bell better, and cilantro. A quick, fresh, and delicious salad made with tomatoes, olives, English cucumber, and avocado. Dressed in a parsley, lemon, and olive oil vinaigrette. An olive oil and citrus based soup with a blend of fresh bell peppers, tomatoes, and parsley. Topped with avocado. JB’s signature jerk spice chicken served with jasmine rice. A rich and creamy creme brulee topped with fresh fruit. Reservations are required and are available on our website. Space is limited to 34 people. Must be 21+ to attend.